Last year I taste tested bitter gourds prepared a few different ways and it drew so much attention that I found myself writing down recipes that would never have been recorded. Despite all that creativity, I noticed that my family’s behavior and attitude toward this special vegetable remained unchanged. So this summer I grew fewer plants and spoke even less about it. However, I began sticking it into just about all my meals in small quantities. Chop up the bitter gourd into fine bits as you would an onion and use in same way as onion, garlic or hot peppers. A few days ago, I threw about 1/3 cup of bitter gourd right into my omelet along with chopped up eggplant, squash, peppers, dried cherry tomatoes, garlic and onion, and no one noticed. 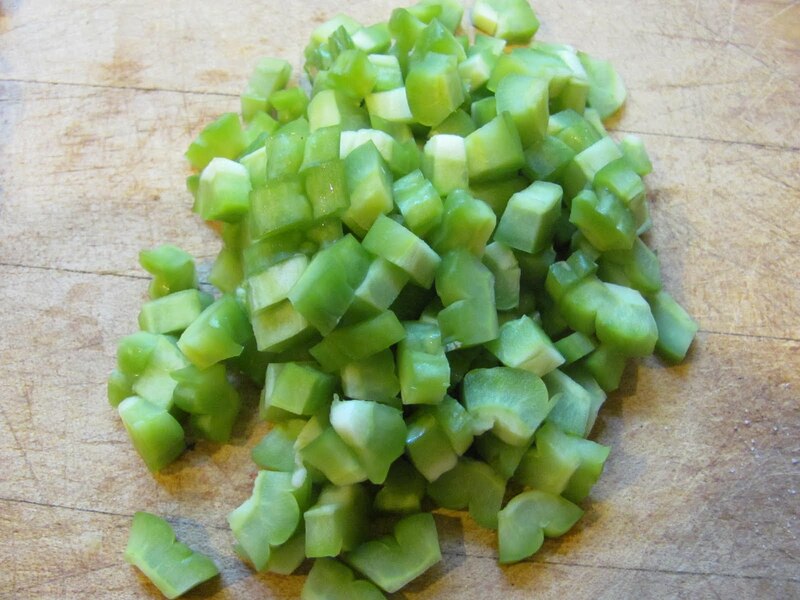 Consider adding finely chopped bitter gourd to your quiche, spaghetti sauce, stews, soups, fried rice, lo mein and just about anything else. Here are pictures and recipes of some of the ways I managed to sneak it into my family’s diet without anyone noticing. In this preparation, I used Korean Squash, another lovely large crunchy vegetable with a delicate taste, celery, red peppers, green peppers, onion and garlic from the garden, along with shitake mushrooms from the farmers’ market. I sautéed everything, including the finely-chopped bitter gourd, and tossed it all into the pre-cooked barley. 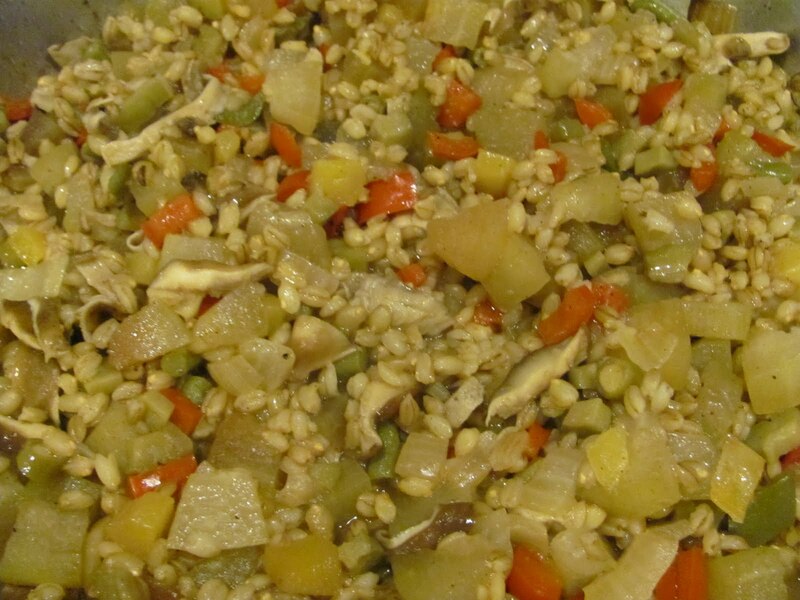 I then added some chicken broth (vegetarians could use water or a different broth) and baked it in a low 325 oven until the barley was fully cooked and had absorbed the flavors of the vegetables. No one noticed the presence of bitter gourd. 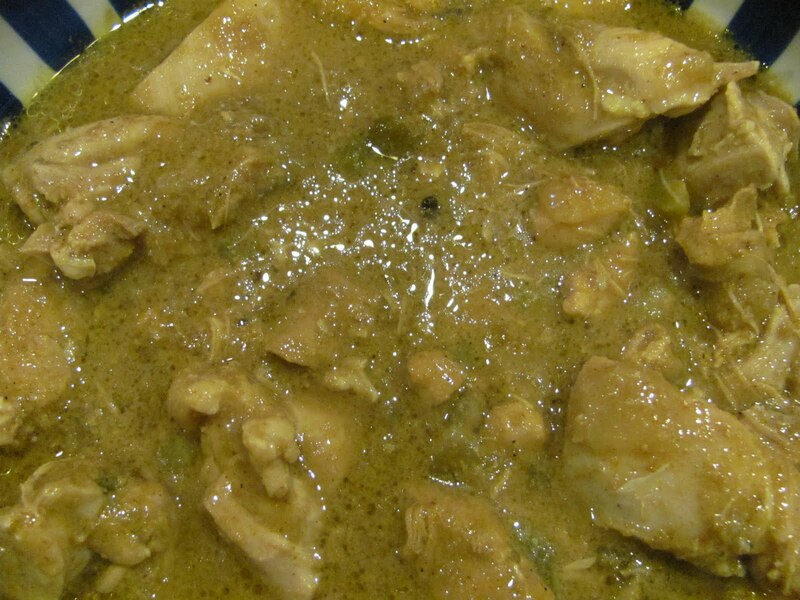 Bitter gourd is typically not hidden in chicken curry in Indian cuisine. However, since my family likes chicken curry, I thought it presented a good opportunity. Here’s one version of a chicken curry that even those who don’t like very spicy food may like. For this curry, you start by washing your cut up chicken in watered down lemon juice. In a separate bowl, place enough non-fat yoghurt to cover all the chicken and mix in the following powdered spices: coriander, 1tblspn; cumin 1 tspn; chili, ½ tspn; paprika, ½ tspn. Mix the spices into the yoghurt, add chicken, mix well and let sit for about two hours. Fry together the equivalent of roughly one medium onion or two shallots, about one inch of ginger finely chopped, about six cloves of garlic, finely chopped. This is the place to also add about one cup or more of finely chopped bitter gourd. Sauté well. Then add about 6-10 whole green cardamom pods and 6-10 whole cloves, one 4-inch piece of cinnamon stick, broken into two or three pieces. Continue frying for about two more minutes. Finally, put in the chicken/yoghurt mix and cook gently until the meat is cooked through. Then sprinkle a teaspoon or two of Garam Masala (available at most grocery stores in ethnic food section) and simmer for about 20 minutes. Serve garnished with fresh chopped cilantro. The rich flavors of this curry completely hide the bitterness of the bitter gourd. In the curry pictured above, I also added some celery and a little green pepper from my garden, just in case someone noticed green bits. Any vegetables that are not soggy may be added, such as potato, turnip, carrots, green beans, etc. 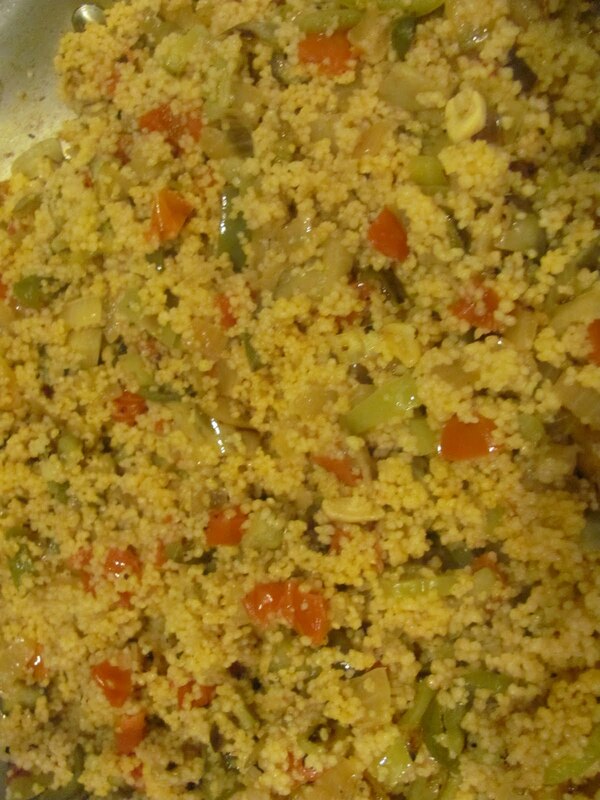 The last recipe is for cous cous. Much like the barley, I simply chopped up whatever I had in the garden—in this version, there is purple and white eggplant, finely chopped green beans (they are tough at this time of year! ), green, yellow and red peppers, garlic, onion, and, of course, the bitter gourd. I sautéed everything, added 2.5 cups of chicken broth and brought to boil. Then I sprinkled one cup of cous cous, turned off the flame, closed the dish and let it sit until the cous cous cooked through. This is another family favorite, and no one noticed the bitter gourd. This year we have consumed far more bitter gourd than we did last year. In fact I have none left to freeze for use in the winter. I’ve had to forego my preference for simply steamed bitter gourd as that tends to draw too much attention to it. However, I have managed to get it into my family’s diet, and happily so. ← Tomato Patch: Time for green manure? This is fantastic; thank you! We grew lots of beautiful bitter gourds at the demo garden this year, but ended up giving them away to people's neighbors and so forth (I gave some to a garden visitor yesterday) since most of us didn't care for the taste. I just recently steamed and froze some to experiment with over the winter, in small quantities in larger dishes. Glad to know it works for your family. Bitter gourd is good if you stir fry it w/ chopped up ham and eggs with olive oil, chopped garlic, and black peppers. Garnish with chopped scallions and cilantro.